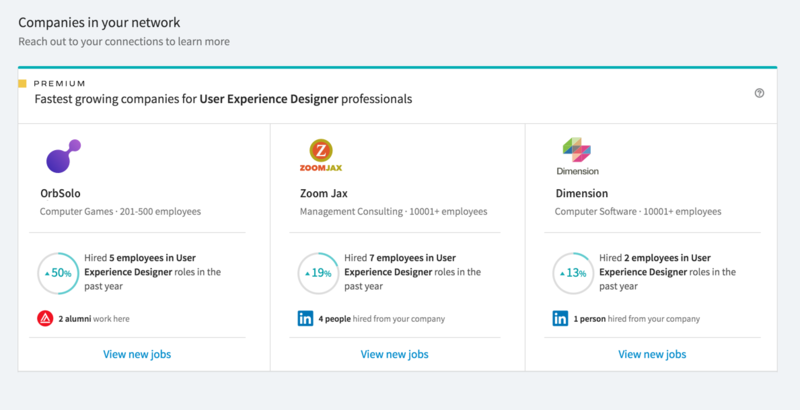 Attention all job seekers: we’ve just added even more personalized insights to LinkedIn Jobs to highlight your key connections at a company and help you rise to the top of that stack of resumes. In today’s world of ubiquitous online job postings, it’s no longer about finding jobs, but finding the right job and leveraging your competitive edge to land it, once you do. Do you have connections at the company? Does the company typically hire from your alma mater or current company? This is the type of insider intel that can make all the difference as you’re navigating your job search. With that in mind, we are saying goodbye to the static, one-dimensional jobs boards for good and continuing to build our new job seeking experience, which surfaces network-driven data to help you search and apply smarter. Last December, we unveiled brand new insights on LinkedIn job postings, spotlighting your connections at a hiring company, the team you might work with if you get the job as well as the company’s growth and hiring trends. Today, we’re extending these types of insights across our Jobs ecosystem to ensure you’re seeing your “in” front and center as you search and browse job opportunities. According to a 2015 LinkedIn survey, 40% of job changers were hired at a company where they had at least one connection. Now, at a glance, you can see how you are connected to a company including your connections as well as fellow school alumni and company alumni at the company. We know the application process can, at times, feel like an opaque and mysterious undertaking. With our new Premium insights, we aim to bring more transparency to the process and empower you on your journey with two crucial recommendations personalized just to you: the jobs and companies where your competitive edge stands out most. Know When You Have the Upper Hand. Now, when you open your LinkedIn Jobs homepage, we’ll recommend any jobs for which our data signals you’d be in the top 50% of applicants, based on the role and the experience and skills listed on your profile. Keep Your Eyes on the Prize. We will also highlight companies that are growing quickly for professions similar to yours based on company hiring trends over the past 12 months. Knowing a job’s description is no longer enough, you need competitive intel to ensure you’re standing out from what is typically a very crowded applicant pool. These new insights aim to help you do just that. We look forward to continuing this journey toward providing a first-of-its-kind experience for job seekers across the globe. Ultimately, we strive to serve as your personal job seeking concierge - surfacing and organizing the jobs, companies and other relevant information you need in order to find and land the job of your dreams.